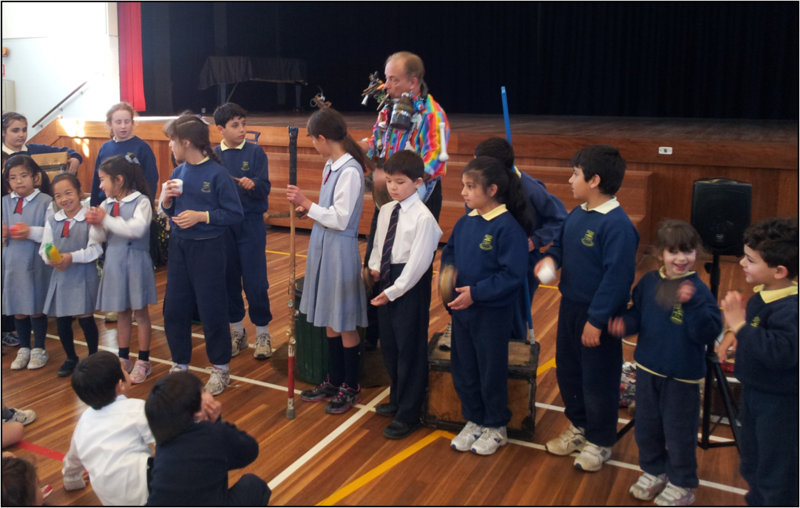 On Tuesday (20/8/2013), as part of our Book Week activities the students travelled to the Sydney Japanese School to take part in a special performance called ‘Rubbish’ by Mic Conway (the original Captain Feather Sword!) who presented a show to learn about the 3R’s (Reduce, Reuse, Recycle). “Magic Mic” Conway got the message across with a circus of comedy, magic and mayhem! He put the fun into Recycling with all kinds of junk musical instruments. He Reused the garbage out of the bin to make magic and Reduced his audience to tears of laughter with his songs and serious silliness! Musical garbage bins and rubbish, junk costumes, light juggling, magic with water bottles and cans, ripping newspapers, a cranky little boy puppet and loads of audience participation made for a load of rubbish! - entertaining and educational rubbish.